Getting a brand new computer gaming rig soon? 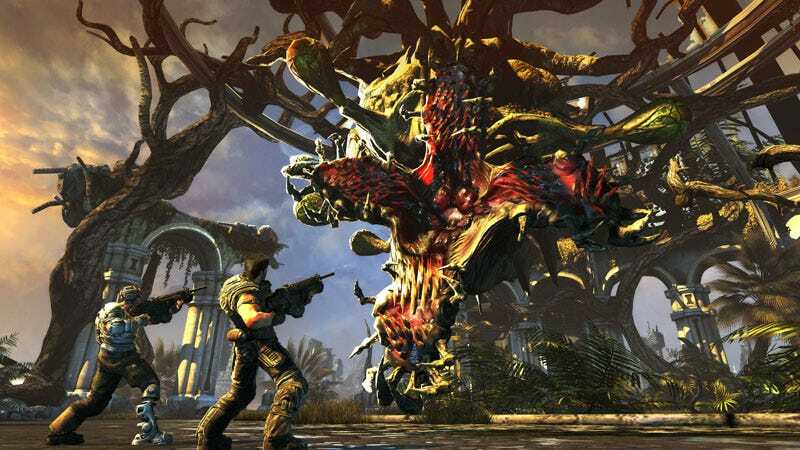 Mike Capps, president of Epic Games, says you should let it rest up for the release of Bulletstorm next week. I asked Capps, as he strolled down the Academy of Interactive Arts & Sciences red carpet last week, how he'd break in a new gaming computer. "It will make (your system) weep if you play it in 3D, full screen, full resolution. It's gorgeous. I'm really proud of it." I asked Capps what he thought of people likening People Can Fly's soon-to-be released, over-the-top shooter with the perpetually delayed, but finally-gonna-launch Duke Nukem Forever. "They are both over the top shooters," he said. "It's funny, before Duke came back to life and Randy (Pitchford) and his guys were able to make it work, we were sort of thinking of Bulletstorm as somewhat of a spiritual successor. "But it's a very different game, it is much more story-based, there are no pig aliens or whatever. No John St. John. We were really glad when they were no longer shipping right on top of us, because I think there is a similar segment that is going to want to play both of those games. It's a fun, pure, have-a-blast shooter game, which I think we need more of right now. There's a little too much serious in games." Bulletstorm's marketing has been as over-the-top as the title promises to be. The company shipped out pulpy orange juice, boxes of raw meat with broken up glasses in it. They created a diorama mocking Halo 3's marketing campaign. And most recently made a playable, albeit very short, send off of Call of Duty. "Activision has been really cool about that," he said. "They're not taking it personally. We love their games, we play them all of the time, we're shooter nerds." Capps said that initially it looked like Duty Calls was going to be just a video, nothing playable. "I was surprised they were able to do it," he said. "I thought it was going to be a video at the end and when they managed to pull that off... a million and a half downloads for a marketing piece."